Local Cheshire Suppliers, one of our favourite farmers ! One of my favourite cuts of meat (of all time!) is the Rump steak from from Red Poll (rare breed) cattle farmed very, very locally in Mickle Trafford, so it can only be a good thing that farmer Huw Rowlands delivers his prime produce to many outlets across Cheshire and North Wales as well as selling to farmers markets. 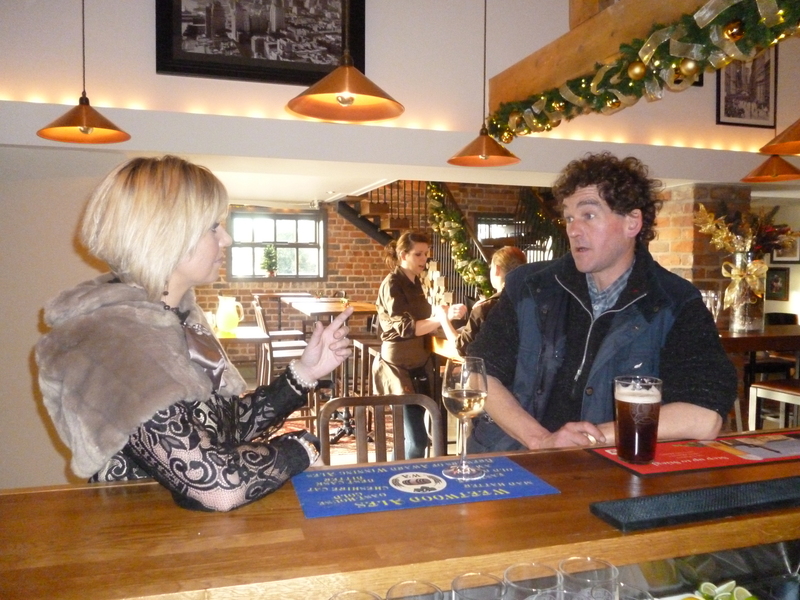 It is always a pleasure to catch up with Huw for a pint of something local (his favourite is Spitting Feathers real ale brewed just down the road in Waverton) to talk about famers markets, real ales and of course his beloved cattle. Huw’s family has been farming at The Grange, Mickle Trafford, since 1947. Their main activity is the rearing of traditional breed Red Poll cattle, which they run as a beef suckler herd. They graze the lush meadows of the River Gowy valley for most of the year, although they are housed inside during the winter months. Huw and his family sell meat directly from the farm in any quantity, which is butchered locally. They also grow a small acreage of low input spring barley, and have just over 20 acres of poplar tree plantations. The trees will eventually be used for making items such as shop counters and kitchen worktops, and are a joint venture with the Poplar Tree Company from Lulham in Herefordshire. The family aim to farm in harmony with nature, so use little artificial fertiliser, and only treat their animals with veterinary medicines when absolutely necessary. They also work in partnership with the Trafford Mill Trust on a project to restore the adjoining water mill as a museum and outdoor educational centre. ‘Much of the land visible from the Chester Fields, for example, forms part of The Grange Farm, home of one of the largest herds of rare breed Red Poll cattle in Britain. The farm is in the Higher Level Stewardship Scheme administered by Natural England, and the land visible from the Chester Fields is being managed to encourage over-wintering and breeding wetland birds in an on-going project in partnership with the Cheshire Wildlife Trust. Surveys undertaken by the RSPB in 2004 and 2011 prove that there has been a marked increase in the bird population on the farm because of changed agricultural practices in the last decade. Huw Rowlands is running an Open Farm Sunday Information Evening on Tuesday 28th February from 7:00 p.m. until 9:00 p.m. at The Chester Fields, Chester Road, Bridge Trafford, Chester, Cheshire CH2 4JR. Whether you have participated in Open Farm Sunday before, are contemplating doing so this year, or just want to find out more about it, please do come along for an update. Refreshments will be provided, and it is a great chance to visit this fantastic new venue in a former dairy farm. If all of that isn’t enough – Huw also hosts a Local Produce Fair at the farm last Saturday of every month, 10am till 2pm. Pop in ! This entry was posted in Food & Drink Chester, Cheshire, Flintshire and tagged Cheshire, Cheshire Beef, Chester, Chester restaurants, Country pub, Food & Drink Chester, Cheshire, Flintshire, Local Produce, Local Suppliers, Real Ale, Sunday Lunch, The Chester Fields. Bookmark the permalink.